Brown Squirrel Has Been Your Hometown Furniture Store Since 1971! Local stores keep profits circulating within the local economy. They also support a variant of other local businesses. They create opportunities for local service providers, like accountants, contractors, architects, insurance brokers, advertising agencies, computer consultants, attorneys, designers, printers. They do business with the community bank. They advertise through independent radio stations and other local media outlets. Local retailers and distributors also carry a higher percentage of locally-made good than the chains, creating more jobs for local producers. In this way, a dollar spent at a locally owned business sends a ripple of economic benefits through the community. Keep dollars in our local economy. Your dollars spent in locally-owned businesses have three times the impact on your community as a dollar spent at national chains. When shopping locally, you simultaneously create jobs, fund more city services through sales tax, invest in neighborhood improvement and promote community development. 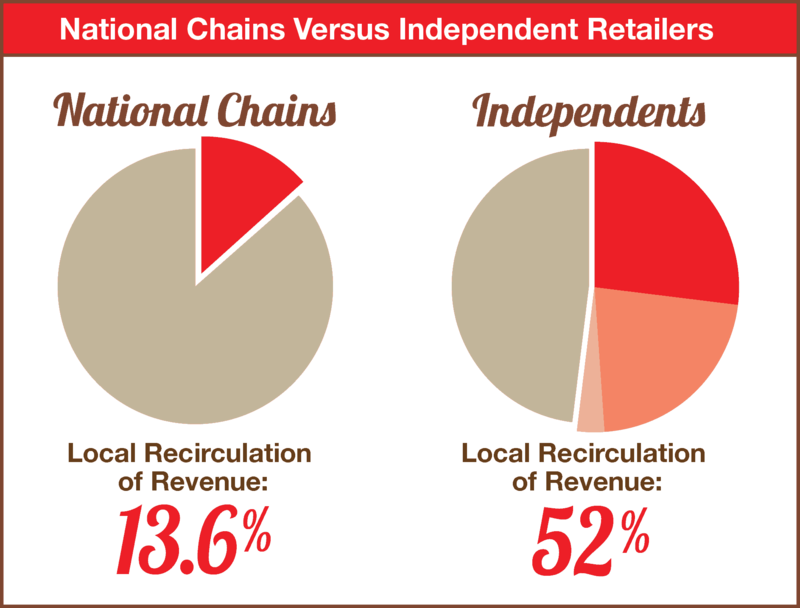 These factors lead local independent merchants to create a multiplier effect in the local economy of 3-3 1/2 times that of a chain. While many communities focus on sales tax revenue, we need to remember that the one-time tax revenue is only one part of the economic picture.